He spends his Holiday season there, visiting with families from all over, delighting children and adults, bringing joy to everyone who stops by to visit. Sometimes Santa’s reindeer are able to visit as well. 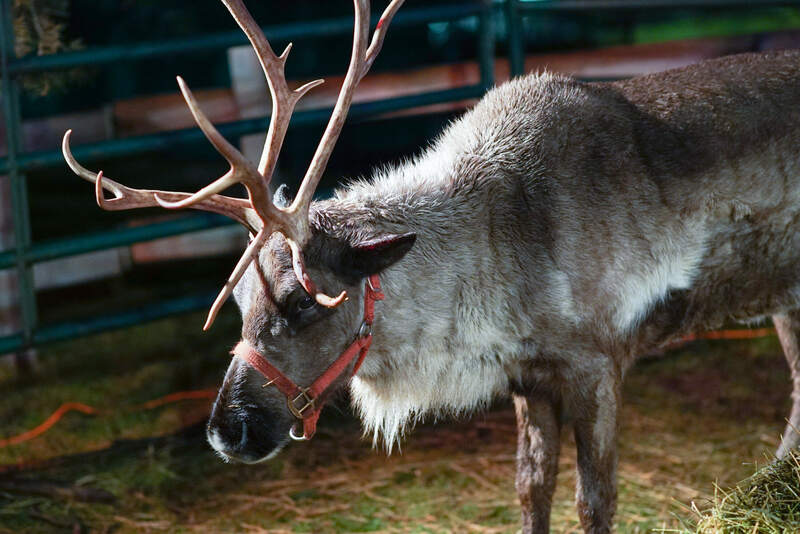 We’re not always sure when they will be there – the reindeer have a lot of training to do to get in shape for the big night – but when they do stop in, it’s a special treat. Santa is happy to pose for a picture (bring your own camera) and there is always a friendly volunteer elf to help. There is no cost to visit with Santa. The Midland Santa House is located on the corner of Main St. and M-20 in Downtown Midland. If you’re looking up directions from a GPS, we are directly across the street from the First United Methodist Church. 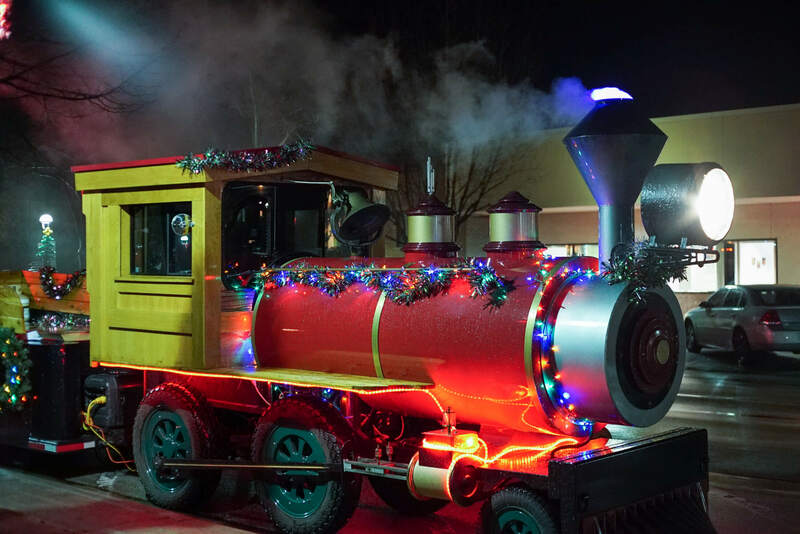 The Northern Star train will provide tours of downtown Midland during the Santa House season. The train will depart from the Midland County Courthouse (Main St.) and take a 10-15 minute trip before safely bringing passengers back to the courthouse. Visits with Santa are free! Wait times vary, so please arrive at least 45 minutes prior to closing. Even with an early arrival, visits are not guaranteed. 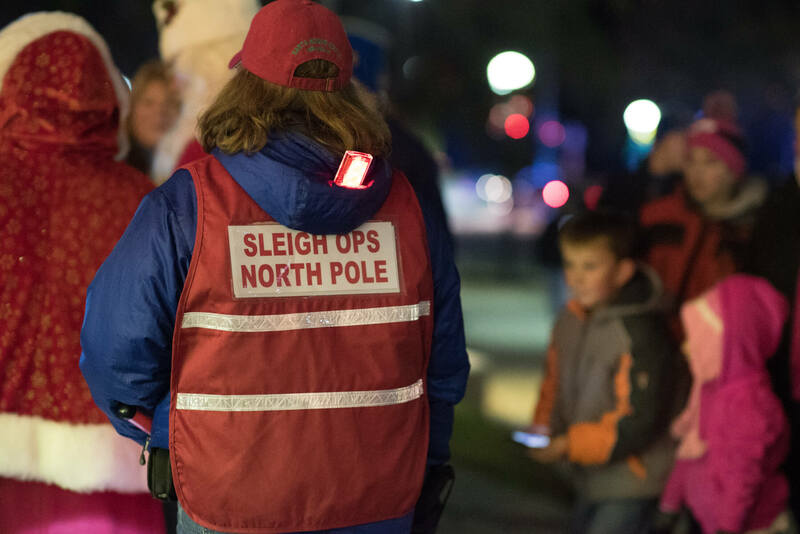 Volunteers are needed throughout the month of December for the Santa House as well as the Northern Star trackless train. 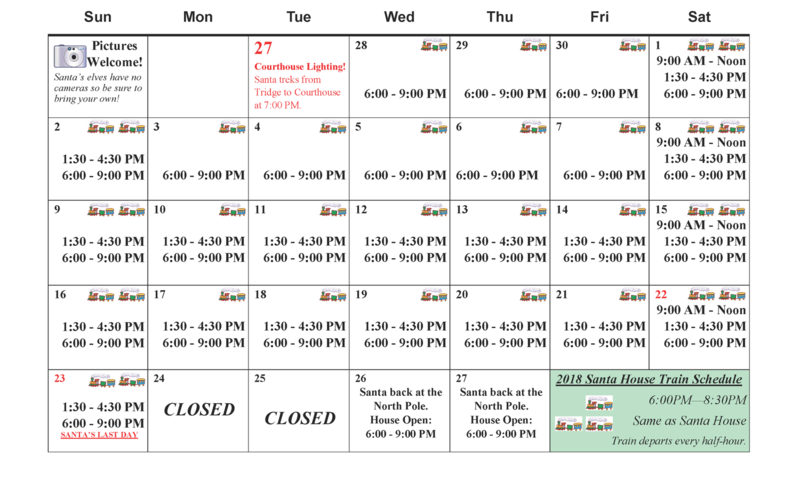 Shifts are between 1.5 – 3 hours each and correspond with the Santa House/Northern Star schedules below. To sign up, please contact Laura Dittenber at 989.839.9661 or email info@midlandfoundation.org. It’s a magical evening each year when the lights go on in front of Midland’s courthouse and, for many children and adults, the holidays begin! Every year the courthouse lighting heralds Santa’s arrival and the opening of his house for visitors young and old alike. 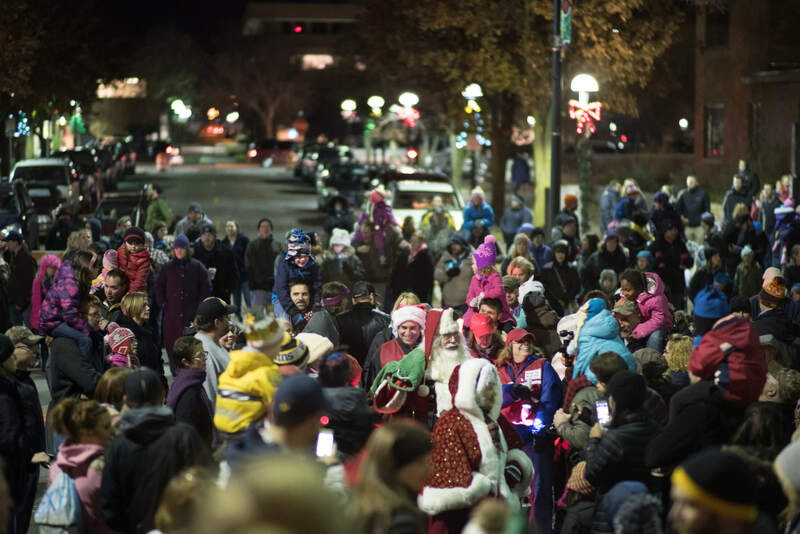 This year the Courthouse Lighting will commence on Tuesday, November 27, 2018 at 7:00 p.m. The tradition began in the 1930s when Mrs. Herbert H. Dow made sure that small trees decorated with many tiny lights were placed around the Midland County Courthouse each Christmas season. According to those who remember, it was truly a lovely sight. 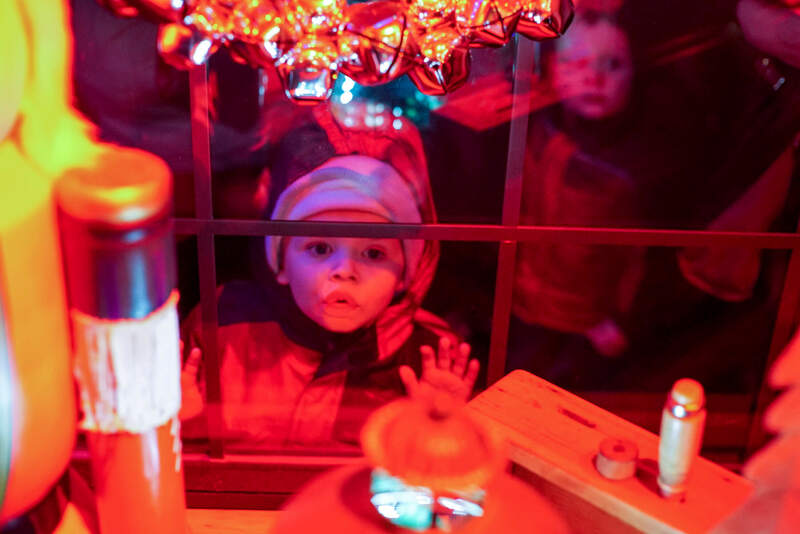 Today the Midland Area Community Foundation continues the tradition by sponsoring, with earnings from the Gilbert and Eleanor Currie Christmas Lighting/Santa House Endowment Fund, the seasonal displays and the Santa House. 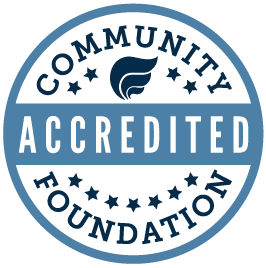 Working in close cooperation with Midland County, the City of Midland, and numerous volunteers, the Foundation offers this experience as a gift to the people of the Midland area. Before World War II (1941), the courthouse was a great deal smaller and Main Street considerably less populated. No large Methodist Church stood across the street. During those years, Mrs. Dow arranged for a display each season. During the war years there were no lights. Beginning in the late 1940s, Gil Currie and his friend Bob Wilson, who owned a business across the street, decided it was time for a holiday display once again. Gil and Bob, men who were still children at heart, loved Christmas lights and worked to establish a tradition which is still enjoyed today. By the 1950s, Main Street had changed and the courthouse expanded to its present size. Something unique was needed. Wally Bronner of Frankenmuth helped develop the ideas and sketched out a plan. There were many amusing tales surrounding the creating of the first displays – the time it took three trips to the forest and three trees before one was perfect enough for the center of the “traditional” section; the building of the first gingerbread house using the Currie children’s toys; and the live deer that needed companionship during the night to keep them happy. Working quietly behind the scenes was Floyd Wenglikowski who sustained the glow of lights and maintained the displays. When the lights are turned on and the children’s happy faces glow with excitement, the project is worth the hours of planning and effort. Enjoyment for the children has always been the projects main goal. 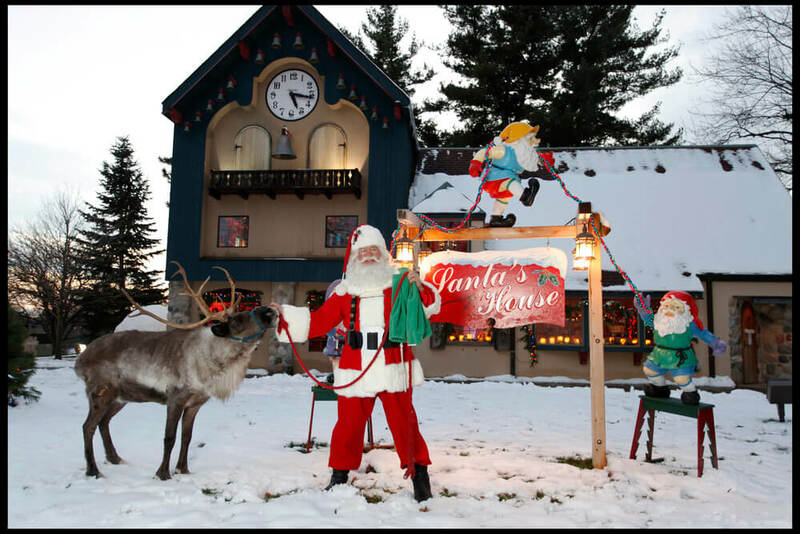 The present Santa House was built in 1987, thanks to the Midland Area Community Foundation and area donors. It replaced the temporary structure which needed to be erected and dismantled each year and which had fallen into disrepair. Architect Steve Barstow and Tom Valent from Gerace Construction did the research and developed the plans for the new house. Its stucco and fieldstone exterior, approved by the Historical Commission, helped Santa’s residence blend with the courthouse architecture. It featured a slanted roof for reindeer take- offs and a bay window trimmed for the holidays. The building’s interior was a wonderful mixture of two lofts filled with holiday displays, a fieldstone fireplace, a Grandfather’s clock and a carved chair for Santa. Throughout the house elves were busily at work – truly a joy to behold. Gerace Construction Company and other contractors eagerly stepped forward when they heard about the project and proceeded to build the house. Under Steve Barstow’s watchful eye and Gerace Construction’s leadership, Blasy Electric, Pat’s Gradall, Haddix Lumber, 4-D Builders, Fisher Sand and Gravel, Brandle Roofing, Ramar Construction, France Electric, Cook’s of Midland, Dow Chemical Company, Ritter Signs, and many anonymous donors made the dream a reality. Once completed the Santa House was given to Midland County. The agreement was that it be made available to the Midland Foundation each year in November, December and January for Santa’s use. In October, the Charles W. Howard Santa Claus School, the oldest and only non-profit Santa School in the world is held for three days in Midland’s Santa House. In 1997 a Glockenspiel was added to the House made possible by a gift from the Dow Chemical Company in celebration of their 100th Anniversary. Shutters were also added thanks to the generosity of Mrs. Anderson (Dorothy) Arbury. 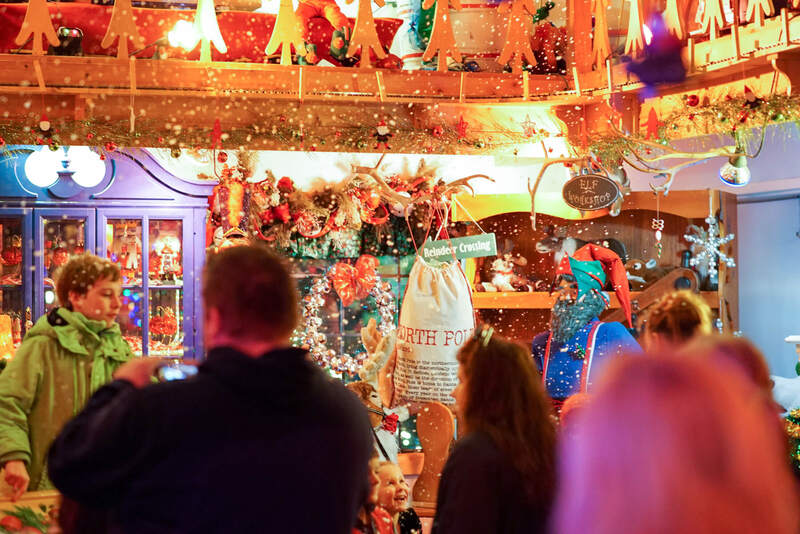 Because of Tom Valent’s imagination, creativity and direct line to Santa, new displays magically appear each year which allow thousands of children, their families and friends to experience fantasy and excitement. The Santa House is truly a meaningful bit of Midland history. Let us hope that it will continue to bring holiday happiness to all for many years to come.